That is, if you aren’t already. Obviously, I’m talking about the new series on FOX, and not the venerable movie franchise. Although, I highly recommend you watch those films as well. 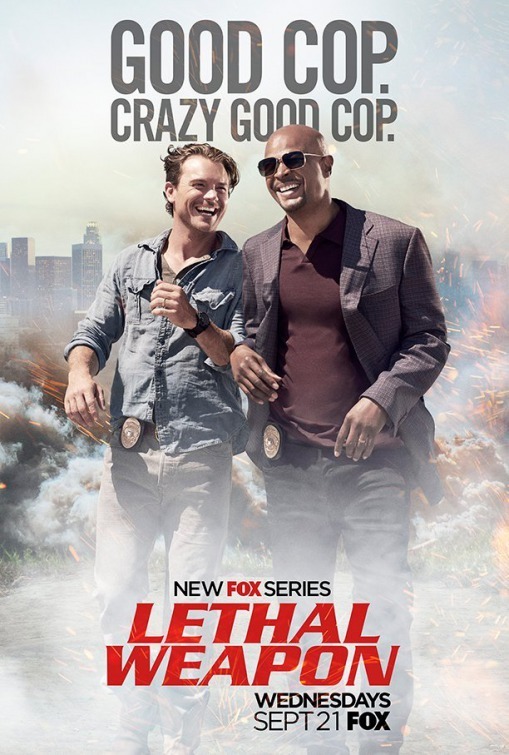 This new series, starring Clayne Crawford and Damon Wayans is fantastic. It was really a surprise to both my wife and I how much we have come to really enjoy this show. This season, we had FOX try something bold with 2 new series. “The Exorcist” and “Lethal Weapon,” both based on successful films franchise. I didn’t even give “The Exorcist” a chance, and I was hesitant to watch “Lethal Weapon” because I didn’t want to encourage this sort of behavior. The dynamic between officers Riggs and Murtaugh was established and defined by Mel Gibson and Danny Glover, respectively, on the big screen. Based solely on the commercials I saw leading up to the shows premiere, the only similarity I could find between film and small screen was the color of each of the actors. Then, the first episode aired. I recorded it. Then the second, and I recorded that one too. Finally, after maybe 3 episodes were recorded, I decided to give it a shot. At first, I was hesitant to accept either actor in their designated role. In my mind I was nitpicking each one’s portrayal of a character that I had kind of grown up with and was already used to seeing played a certain way. I was familiar with their backstory, their families, basically what had transpired in the films. Where was Joe Pesci?! Then, something happened. I realized that Kevin Rahm was in this show as well. He plays Capt. Brooks (tv version of Capt. Murphy), and gets just as frustrated with these two as you would expect. I have been a fan of Mr. Rahm’s work since he was Judging Amy. Most recently, his appearances on Madam Secretary were fantastic, and continued to foster my appreciation for his talent. So, it was at that point I decided to have an open mind, and give this show a chance. Boy, am I glad I did. Once I let myself watch and appreciate the story being told in front of me, I was hooked. I needed to let go of any preconceived notion, or nostalgia I had that was tied to the name of this show, and just watch what was being presented in front of me. I have a feeling that this is something I, and many more fans of other properties will need to be doing in the near future. I am not going to make some bold comparison and say that this show is as deep, and complex as Game of Thrones, but I find it just as entertaining. Seriously. I am just as excited to see a new episode of Lethal Weapon recorded as I am an episode of Game of Thrones. The creators and producers and writers are still finding their voices, and their way, but they are on the right path, that is for sure. As of this posting we are 12 episodes into the first season, and the actors have certainly found their voices. I’m not going to lie, the first couple of episodes were rough around the edges, and you could tell everyone was still feeling out how they were can portray their characters. But, around episode 6 or 7, I knew I was hooked. I can’t recall the specific scene or sequence of events, that lead me to that conclusion, but I remember the feeling. I was laughing and smiling at almost every other scene. By the end of the episode I was just in a good mood, and couldn’t wait for another one. That’s how I knew. At this point in the season, I am happy with how things are developing and I am eager to see where they go and the note with which it ends on. This first season is scheduled for 18 episodes, and a second season renewal hasn’t been announced yet. Considering FOX is already on my naughty list for possibly not wanting to renew “Pitch”, they best do themselves a favor and not loose a viewer by cancelling “Lethal Weapon” too soon. This is a show that can find the right audience and get the numbers the network wants, but they have to let it stay on the air for a while longer and get the word of mouth it deserves. I’ll do my part, but they better do theirs too!